It was the prefect end to a prefect season. Warde junior Charlie Kane completed an undefeated season by wining the 138-pound class in the New England Wrestling Championships at North Andover, Mass., last weekend. Kane defeated Ryan Monteiro of Minnechaug (Mass.) 5-1 in the final to become the Mustangs' first even New England champion. Kane won four matches at the New England's to end with a 48-0 record. After an opening round bye, Kane defeated Hunter Costa of St. John's Prep (Mass.) 4-1, bested Danny Scalzo of Timberlane (N.H) 14-8 and then took a 5-2 decision over Chris Behen of Danvers (Mass. ), before beating Monteiro in the finals. "Charlie had an excellent year. He stayed consistent throughout the entire season," Warde coach Jason Shaughnessy said. "He wrestled tough. We had a tough schedule and he wrestled a lot of tough matches and tough kids and he continued to give winning performances week in and week out. "What he did this year, that's who Charlie is," Shaughnessy said. "He's very driven, very motivated, very grinding opponent and he performed at a very high level this season." Overall, Warde finished third in the New England's as a team, thanks to senior Dan Ebert, who lost in the 145-pound finals to Ryan Peters of Timberlane (N.H.) by a 4-3 decision. And Charlie's brother Tim, a sophomore, finished in third place, beating Peter Delgallo of Gardiner, Maine 7-6 in the 126-pound class. 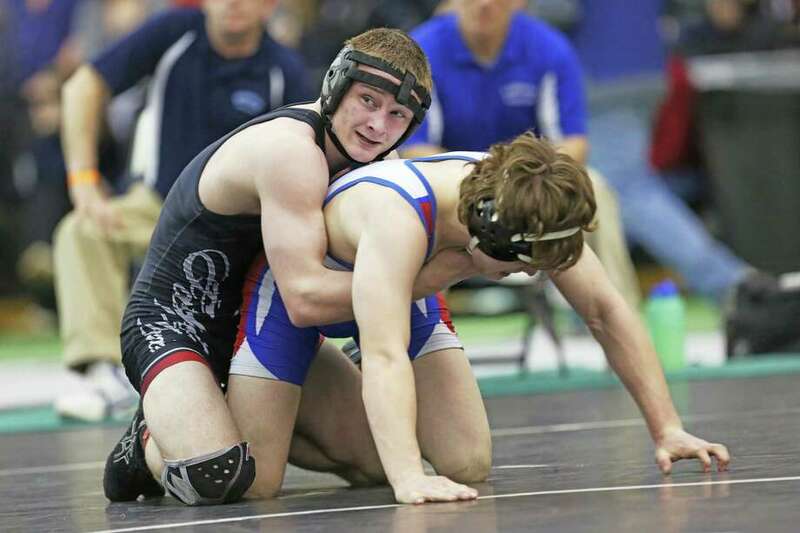 Ludlowe's Chase Lind became the second Falcons' wrestler to make the New England Tournament and he fared well, winning three matches and just missing out on a top six finish in the 152-pound weight class. Lind, a junior, lost his opening match in triple overtime, 9-7 to Dominick Day of Biddeford, Maine, before winning consolation round matches against Justin Stacy of Marshwo, Maine, 5-4, Noble Shaler of Mt. Anthony, Vermont, 5-2 and Johnny Perra of St. John's (Vermont) 6-3 before falling to Newtown's Joe Accousti 6-3 in double overtime. "He made it into the top eight but they don't wrestle for seventh and eighth place at the New England's," said Ludlowe head coach Nick Garoffolo. "That's kind of a hard pill to swallow." During the regular season Lind finished with a 34-1 record, along with winning both the FCIAC tournament and the Class L tournament, along with finishing fourth in the State Open. Overall, Lind went 47-5 for the season and is now 122-27 in his career. "Chase is just a remarkable wrestler and athlete," Garoffolo said. "He's basically done better than any other Ludlowe wrestler before him. He's a pretty remarkable kid and he's on pace to becoming the (school's) all-time wins record holder by a big margin next season, if he stays healthy. He's pretty incredible. He's very coachable, he's a great student and he's easy to work with." Tim Kane pinned Greg Watert of Plymouth (Mass.) in 1:01 in his first match before posting a 19-2 technical fall decision over Kevin Thomas of Natick (Mass.) in round two. Kane then lost a 2-1 decision to Bradley Beau of Marshwood, Maine, which forced him into the consolation bracket against Andrew Ellis of Arlington, Mass., who he defeated by pin in 26 seconds, which put him into the third place match against Gardiner. Kane's 4-1 New England record gave him a 48-1 record for the season. "His bracket (126) was a tough bracket with a lot of depth," Shaughnessy said. "This kid (Beau) he lost to was 54-0 going into the match. Tim gave him a good match, a very competitive match but he fell just short. And to get third, he beat a guy (Gardiner) that beat him in New England's last year." Ebert defeated John Arruda of Bishop Hendrick, Rhode Island, by a technical fall (15-0) and then pinned Otto Kelsker of Noble, Maine, in 3:35. Next, Ebert defeated Dominic Hah of St. John's, Vermont, 7-3 and bested Ronan Ball of Nashoba, Mass., 8-6, putting him in the finals against Peters. "He had a very strong performance and literally was just a hair away from getting a reversal and winning the match (against Peters)," Shaughnessy said. "Dan's had a great season. He moved up from 126 to 145 and performed well." Notre Dame's Hakim Fleming was pinned in his first match at 285 pounds by Austin Shrew of Westfield (Mass.) and then was pinned in the consolation round by Brennan San of North Attleboro (Mass. ).